Millions turn to non-steroidal anti-inflammatories (NSAIDs) and analgesics, like Tylenol, for pain relief, but the regular, chronic use of these types of medications is associated with significant, and very serious, side effects such as cardiovascular problems, gastrointestinal harm and kidney and/or liver damage. There are natural alternative that already exist that are as easily accessible and inexpensive as the spices found in your kitchen cupboard. Turmeric (Curcuma longa), is a bright yellow spice. 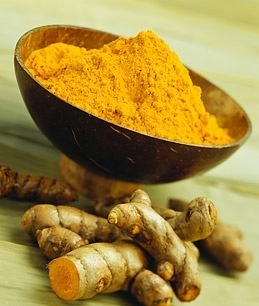 Even more potent than its volatile oil is the yellow or orange pigment of turmeric, which is called curcumin. It’s a powerful natural spice that has long been used in the Chinese and Indian systems of medicine as an anti-inflammatory agent to treat a variety of conditions, including flatulence, jaundice, menstrual difficulties, bloody urine, hemorrhage, toothache, bruises, chest pain, and colic. Despite many years of investigation as a lead drug compound, and the availability of thousands of preclinical studies indicating turmeric’s therapeutic value, many people haven’t realize that this common kitchen spice may offer a suitable drug alternative for common health conditions. We’re living in a world that depends on popping pills to treat illnesses and it’s also affecting how investors spend their money. Not many companies are willing to do the human research on the health benefits of turmeric, mainly due to lack of capital available to fund expensive clinical trials. A study that confirm turmeric’s medicinal value was published in the Indonesian Journal of Internal Medicine in April, 2012. The study found the curcuminoid extract of turmeric was able to reduce inflammation in patients suffering from knee osteoarthritis. To read the entire study click here! The results are astonishing and very promising. I urge you to pass this article on and reblogg. It’s very important to spread the word about this Super-spice. Pingback: Resveratrol As An Anti-Inflammatory Agent – What Are the Anti-Inflammation Effects of Resveratrol? Pingback: Common spice that fights cancer? « all things hot pink!